Eating out with a toddler is always an adventure. Not every restaurant likes to see parents arriving in with small children. Those same small children don’t eat much, they can have a tendency to be noisy, and there’s always the potential that they’ll fling food around the room given half a chance. We eat out quite a bit, so because he’s used to it, Little Man is generally well-behaved when we’re in a restaurant. That’s not to say that he couldn’t take a notion to up-end his dinner on the floor (or the waitress!) if the mood strikes him. He is a toddler after all. So it’s always great to find a restaurant that is prepared for young diners and welcomes them. We’ve found quite a few cafés for breakfast or lunch that cater for small children, but finding a place for dinner that does the same is harder. That’s why we like Nando’s so much. They have wooden high chairs that fit perfectly under their tables and allow your toddler to sit at the table with everyone else. They do have a kiddie’s menu as well, but we never order from it. Instead we order a mixture of chicken dishes and various side orders, and we feed Little Man from our plates. Good thing he likes spicy food though, because some of their seasoning is HOT! 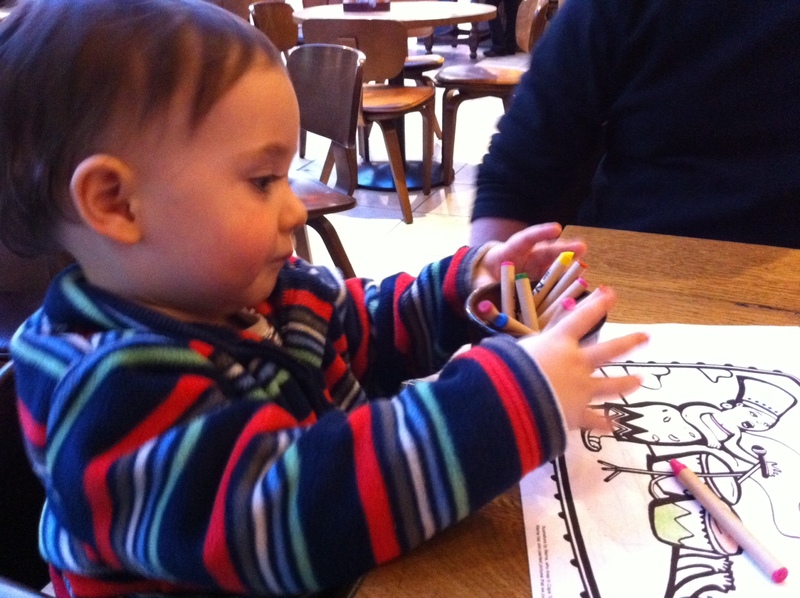 Food and seating aside, my favourite thing about eating at Nando’s is that they recognise that children are a lot better behaved when they are entertained, so they provide colouring pages and pots of crayons. I know that a few places do this, but Nando’s do it well. As we are walking into the restaurant these days, Little Man gets really excited and says “co-or, co-or!” – it’s the closest he can get to saying “colour”! There’s a selection of pictures to choose from, and on the back of some of the sheets, there are little activities for the older children. Tonight, we coloured a picture of an elephant, last time it was a chicken. I wonder what it will be next time?